Every now and again I come across a knowledge diamant. Mike Bogle's blog Techticker is the knowledge diamond of the month! Btw if you surf to his blog, chances are you will hear his voice spring out of your boxes spontaneously, in that case scroll down to his post on twitcam to pauze his voice, or to simply take a look at his (nice) face. Coming across his blog through a comment in the recently started CCK09 course that I posted just a couple of days ago, I was in awe by the amount of knowledge spread in his blog. Thanks to Mike I got hold of the Disqus software that enables you or anyone who reads a blogpost to comment through her or his favorite social media site (well not all social media sites are possible, but still it has some major ones enabled). An added bonus of adding Disqus to your blog or site, is that it enables users to reply on comments as well. Which allows all of us to read comments in a more dialoged/natural way (why wait for Google wave to use threads in this way?). Disqus can (optionally) send you updates of comments that have been posted, so you can easily be posted. The only thing I am not sure about right now is how non-spam Disqus is if you allow anyone to post... so I will wait and take a chance. 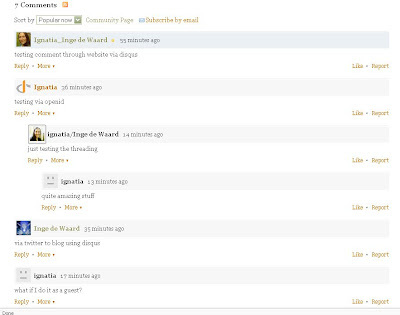 But the blogger widget on 'my recent comments' will be thrown out now... but had too many widgets on here anyway. First I wanted to delete this one, but I leave it as is for sample purposes. Social Media is a much hyped term the last years. But what if you did not launch yourself in it? Or what if you feel uncomfortable and want to know more before diving in? In that case a nice, cool, descriptive book has been published from the O'Reilly series. At least it looks cool if you take a look at some of the content that is in it as picked out by the author Tamar Weinberg. "Blogs, networking sites, and other examples of the social web provide businesses with a largely untapped marketing channel for products and services. But how do you take advantage of them? 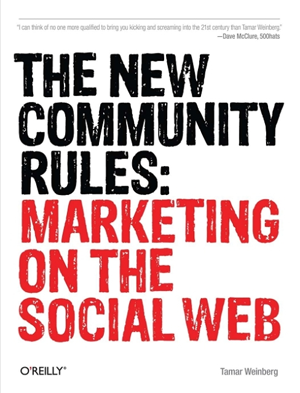 With The New Community Rules, you'll understand how social web technologies work, and learn the most practical and effective ways to reach people who frequent these sites. Written by an expert in social media and viral marketing, this book cuts through the hype and jargon to give you intelligent advice and strategies for positioning your business on the social web, with case studies that show how other companies have used this approach." I am starting the bureaucratic mill right now and hope to get the book delivered some weeks from now. Once read, I'll get back to you. George Siemens and Stephen Downes will co-facilitate the course. The support wiki for the course provides additional information in the coming weeks. Given the interest in the Connectivism and Connective Knowledge course Stephen and I delivered in 2008, ’re pleased to announce an open version of the same course for fall of this year. You can register to receive course information here. The course will be delivered in the same method as last year: content and conversations will be open. Learners that would like formal credit as part of the Certificate in Emerging Technologies for Learning can enroll through University of Manitoba’s Extended Education Faculty. The course will begin on September 14, 2009. If you were registered for The Daily last year, you will need to register again (the archives from last year are still available, but we are starting with a new subscriber base). What will we be doing differently this year? We will again open up the course so participants can take the course in any direction/space/mode that they find useful. Our goal is to provide a starting point for participants to build a distributed infrastructure for innovative conversations. The content of the course will change somewhat, and we’ll bring in a new group of guest speakers. I would also like to see a greater focus on research. If you are interested in conducting research on the course, please contact us. Given advancements in “messing with data”, I would love to see the the creative genius of people like Tony Hirst applied to producing innovative constellations of patterns of conversations. Over the next few weeks, we will update the course site/wiki, schedule, and speakers list. Suggestions, as always, are welcome…"
The twitterworld has been buzzing with the latest twitter hack that gave the hacker access to a lot of sensitive information. This sensitive information was accessible because of a series of factors: passwords that were intercepted amongst others, but what is on everyone's lips is the fact that cloud computing makes everyone's information more vulnerable for hackers. It was a very good and solid communications move of Twitter to openly spread the word on what happened. A lot of teachers and knowledge workers have been increasingly publishing there documents online. 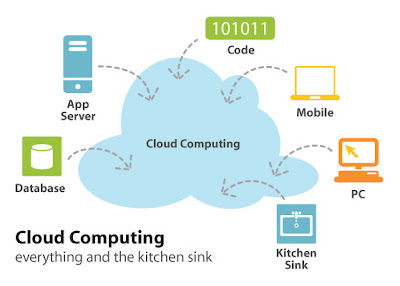 And with the increase of mobile usage cloud computing (in its very basic form) becomes even more popular, mobile cloud computing is mentioned in the Horizon report from earlier this year. And what if learners become more at ease with password hacking programs (and lets be honest, using those is childsplay). But if we keep in mind to use different passwords for different levels of 'security' or add additional encryption if necessary, some easy hacking might be avoided. There are a lot of benefits in using a central location for information and knowledge production: you can access it from anywhere, the whole team can work on it at the same time, it is transparent to everyone involved, ... But it does put your information out there for 'everyone' to see. A more in depth look at all the (technical) features of cloud computing can be read here in the Cisco article or seen in the movie that features Padmasree Warrior from Cisco (and she is a warrior if you look at the apathy of some of the public, keeping going with that lack of interest is a challenge). The last few months many people have been writing about the surplus of networks and finding the content you are looking for as quickly and simple as possible in a knowledge world. Although I agree that linking, filtering and constructing are just a couple of qualities that a contemporary learner (and I see all of the contemporary professionals as learners) should have to keep updated on the latest content and knowledge in a particular field, it is not easy to disseminate your own knowledge. Many knowledge workers mention many options: feeds, streams, blogs, collaborative networks... but at the end of the day you yourself need to stay on top of what people are interested in. But if networks are getting increasingly important, it will be essential to provide your network(s) with immediate extra's. So what part of your brain do others want to pick? What niche might you have? In order to do this you can use a number of analytic tools, but those tools are just providing data for your own interest. What about data that is of immediate use to your own network? Today I came across an easy to use widget that gives just that bit of extra: PostRank. This widget extrapolates your most read blogposts, enabling new readers to take a look at those particular posts others found interesting, thus increasing the chance of your posts being followed. And in addition, if they are interested in case those readers have a specific topic of interest, they can search on that specific topic in the lower end of the widget (look at the widget on the side). In addition to this widget they have a twitter widget for educational blogs as well: http://twitter.com/pr_education (get picked up in this twitter by adding #postrank & #education) through which I found the link to a post of Stephen's Web on 'Should Learning be Free and Open?' written by Curt Bonk. By the way Stephen Downes Ol'Daily is one of my favorite ways to stay on top of what experienced learners have to say about learning... and I do not think the ol'daily has a official hyped term to define what it does, it is just the thing to get connected to if you are interested in learning content (I still have a lot to learn and still have a lot of things to change in order to improve dissemination of interesting learning topics). Thanks to the global educational blogger Christian Kreutz for getting me posted on postrank.